Ice diving is a type of penetration diving where the dive takes place under ice. 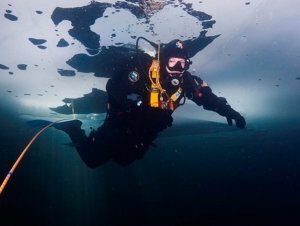 Because diving under ice places the diver in an overhead environment typically with only a single entry/exit point, it is considered an advanced type of diving requiring special training. This special training includes learning about how ice forms, how to recognize unsafe ice conditions, dive site preparation, equipment requirements, and safety drills. Ice divers are tethered for safety. Learning to dive under the ice does require the use of a dry suit so students interested in learning this exciting new skill will need to be a certified dry suit diver. If you’re not already certified as a dry suit diver talk to us about learning to use one prior to the ice diving class.